This was going to be my TeachMeet talk at the Scottish Learning festival this year, if my name had been pulled out of the virtual fruit machine. The kludge refers in this case to my, fairly clunky, attempts to change some things about glow’s interface. Last week I was working with a primary 6 class using GarageBand to create some simple music, the idea was then to upload the pupil files to a glow group into a document library and discuss the music in a discussion forum below. The group is a local Authority one, and the hope is that eventually pupils may comment and assess work from other classrooms and schools. Unfortunately when the children started trying to listen to each others music, the files downloaded and opened in itunes, rather that just played in the browser. This lead to a little confusion and made it hard to move from listening, back to the browser and into a discussion. So I started copying the links to the mp3 files and using dewplayer to provide a flash player. It quickly became apparent that this was going to make the page very big and the players would be separated from the discussion by the document library. It would create a lot of work for me and would not be easily for most teachers to duplicate. I really wanted to automate the process and I’ve found one way to do that. 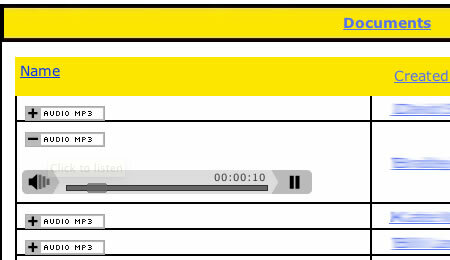 Each link to an mp3 file is changed into a flash player which plays that file. Later today I hope to attend the Glow Development Needs You! event at LTS and find out more about some alterations and enhancements of glow. It looks like there may be quiet a lot to look forward to in glow soon. A while ago (2 years, time flies!) 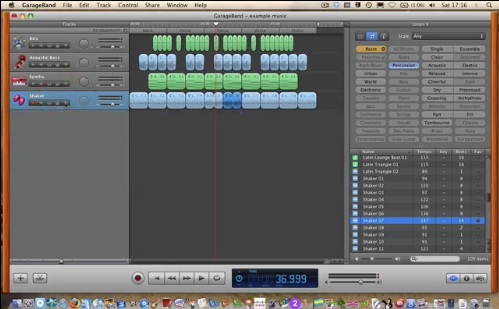 I blogged some GarageBand plans for making simple music in class. I used it a lot at Sandaig, resulting in the Sandaig jukebox. 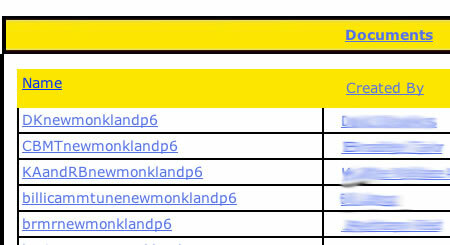 I’ve been using the technique again in developing some glow ict groups in North Lanarkshire. This has given me the chance to work with some pupils again and to improve my instructions. Yesterday I decided to try and screencast the procedure and the result is show above. The process let me work a bit more with ScreenFlow, which is a lovely screencast editor. I am still working on my presentation skills which results in a few odd pauses and repetitions, but I though the movie worth publishing. It also gave me a opportunity to test our Apple Wiki Server to publish the screencast: Simple Music with GarageBand. The Apple Wiki server provides one of the easiest to use podcast publishers I have seen, although configuring and theming the wikis and blog is a bit tricky. I was lucky to have one of the North Lanarkshire network guys set up the server and get me started. 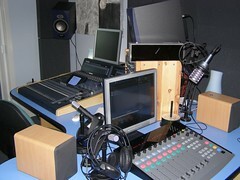 I am looking forward to finding a school or two who would be interested in some podcasting. Some of the experience in themeing the wiki helped me in setting up some glow groups, I found some interesting ways to get glow to do what I want and hope to get the chance to talk about this for 7 minutes at TeachmeetSLF09 on Glow Hacking on Wednesday night. For a blog that claims to be mostly what we are doing with ict in class I’ve not posted much about that recently. 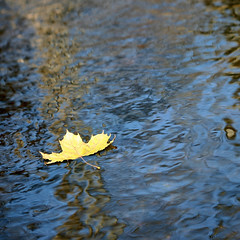 Things have be coming a bit thick and fast for reflection. This is just a wee note about some things that have been going on over the last couple of weeks. One afternoon a week I take a bunch of children from or primary six classes to work on self esteem, emotional literacy and the like through practical activities. The most recent activity is drawing to a close. It this the children created short tunes with GarageBand, then designed covers for a cd. The covers were further edited with picnik. We then burned cds with all 12 tracks and published the mp3s and art on the website: Sandaig Primary Wiki Primary6Project. The children are in the middle of adding a bit of writing to the wiki to round up the project. We have been using GarageBand around the school too. My musical ability has been taken to its limit just making a minute of loop music so I’ve roped in our peripatetic music teacher Martian Douglas who is working with groups of children on a Friday afternoon. At the moment they are just using the loops provided, but Martin is working on incorporating drumming and guitar played by the children. The music made so far can be heard on the Sandaig Jukebox. On Wednesday afternoons I teach ‘the other’ primary six class to cover NCC time. This term I am teaching the Sound part of the glasgow Sound and light topic. I am using a modified topic created by Alisa Barr of nearby Mount Vernon Primary when the children work in groups on challenges to cover the learning outcomes. This has been quite challenging for me and i am not sure I spent enough time on preparing for group work, despite the fat I had attended a couple of cpd events by Alisa on just that. 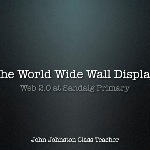 I’ve give the topic a slight web 2 spin as I present the challenges on the Sandaig Primary Wiki SoundAndLight. The first challenge we did as a class and published our findings as a mp3. The next section was on The Ear and the groups tried a variety of ways of reporting their findings. In the current challenge Sound Travels different groups have been set different tasks and seem to be widening there reporting methods (not published yet). These two project have been my first step of using a wiki at school, at the moment the children need support for publishing but hopefully this will improve. Some of the publishing is a bit tricky, eg powerpoint to slideshare and then a recipe to put on wiki. I am using PmWiki which is not wysiwyg but seems to be working out well enough. The topic was interrupted this week by health week which should have been a excellent chance to get the children blogging, but in reality they were to busy with activities, there is a wee movie in the works and hopefully it will be blogged next week. In the midst of the Health week we had a visit from Johanna Hall from BBC Scotland, Johanna had commented on the Sandaig Otters’ blog about Radio Sandaig. She came in to give the children a chance to work on recording some content for the BBC (links when I know them). She also gave a masterclass on speaking and recording for the 12 children involved which I hope they will cascade to their classmates. This also gave me a bit of impetus to get the podcast flowing and we put out a special this week with another one nearly finished. My HT kindly gave me some time out of class to work on these before Johanna’s visit. Johanna took them away with her recording to work into an up and coming BBC production. I am sure I’ve missed one or two things out, but that is probably quite enough for now. I had a bit of bother with this one. I’ve not used keynote much, but it was very easy to create a presentation with. While playing about with it I noticed you could record an audio soundtrack very easily and though I’d do that, export to quicktime or even youtube to let folk see what I’ve been talking about (and to play with the toys). Recording was easy enough, but when I came to export I got errors every time. A quick google fould more folk with the same problem and fixes for keynote 3 & 3, unfortunately I was using keynote 4 and the fixes didn’t work for me. I am guessing the problem has something to do with combining a recorded audio with movies and audio in the presentation. So what should have been a few minutes work turned into a few hours! I exported the presentation to jpgs, then I dug into the presentation package and found the narration audio. Next I imported the into GarageBand and one by one placed the images on the podcast track, adding urls as I went. Next I exported the podcast to iWeb and published it, the first time I had used iWeb and again it seems easy enough to use without having to read a manual. anyway here is a version of the presentation as an enhanced podcast. As a by-product I now have a Podcast. I will not be adding to it very often, but I’ve got some audio from TeachMeet07 which I’ll publish soon. I didn’t manage to record all the presentations, but I’ve got some.